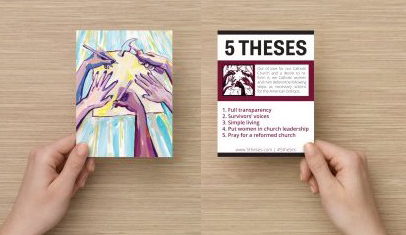 Post the 5 Theses on church and cathedral doors, put them in the collection basket with your two cents, and post them online. Mail a postcard and/or attach your two cents to the postcard and place in offertory collection. Print the 5 Theses, add your signature and home parish, send to your bishop. Print a poster, tape it to your church door. Click here for a list of diocese and bishop addresses. Support small businesses by contacting a local print shop about printing, or print online affordably through websites like Vistaprint, or order online or in store at FedEx for a fast turn around. Left click or Ctrl+click to save these images to your computer, or tap and hold to save to your phone. You can share these on social media or in emails, or update your profile picture. When you share, tag #5theses and @5theses on Instagram. Link to 5theses.com and share your two cents online. Out of love for our Catholic Church and a desire to reform it, we Catholic women and men defend the following steps as necessary actions for the American bishops. We urge the bishops to resolve to take these actions or to dispute them in the form of an open letter to the faithful. In the name of our Lord Jesus Christ, Amen.